SCHENK - Carte de la Petite Tartarie Dresee par ordre de l'Imperatries de toutes las Russies. SCHENK, P. / DE LETH, H. - Carte de la Petite Tartarie Dresee par ordre de l'Imperatries de toutes las Russies. Carte de la Petite Tartarie Dresee par ordre de l'Imperatries de toutes las Russies. - SCHENK, P. / DE LETH, H.
Title : Carte de la Petite Tartarie Dresee par ordre de l'Imperatries de toutes las Russies..
Map maker : SCHENK, P. / DE LETH, H.. Size : 16.1 x 18.5 inches. / 41.0 x 47.0 cm. Description :Very rare first edition of De Leth's map of the southern part of Ukraine, with detailed annotations regarding the Cosaks and an explanatory key. 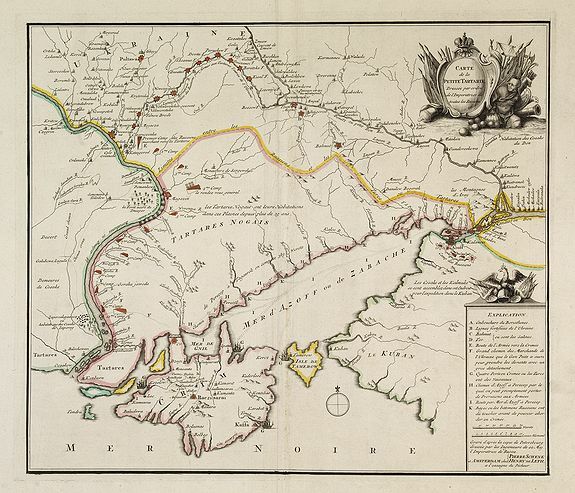 Based on a Russian map, this appears to have been drawn after Russia's annexation of the Crimean Khanate in 1783. The inscription mentions a Russian Empress, and the most likely candidate is Catherine the Great, who ruled from 1762 to 1796 and who engine ered Russia's takeover of the Crimea. Read more about The Crimean War - The Siege of Sevastopol. Condition : Mint condition. Large paper copy.